Start of the 2013 RBC GranFondo Whistler, from downtown Vancouver. 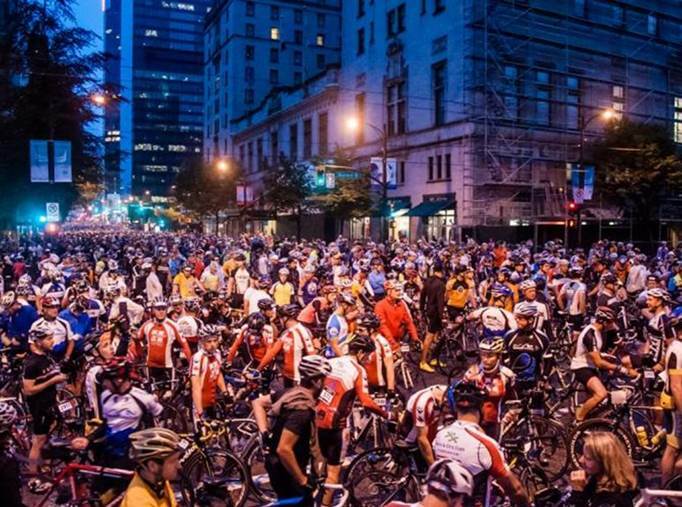 Picture 5,300 cyclists launching from Vancouver, to pedal 122 kilometres up the scenic Sea-to-Sky Highway to Whistler, in a few hours. Or, imagine more than 2,500 Ironman athletes cycling and running a total of 222 kilometres on Highway 99, around Whistler and Pemberton (after a 3.8-kilometre swim in Alta Lake). It’s easy to do – picturing it, not performing it! Photos and accounts of the grit, grime and guts it takes to do the annual RBC Whistler GranFondo and the Subaru Ironman Canada Whistler tell the story. But have you wondered how the way is cleared for those epic events to happen? How do uber athletes compete free and safe from motor vehicles, spectators get breathtaking views, and diverted motor vehicles maintain their momentum? Well, like the athletes, the Ministry of Transportation and Infrastructure does 2,000 pounds (a tonne) of preparation for major athletic events. 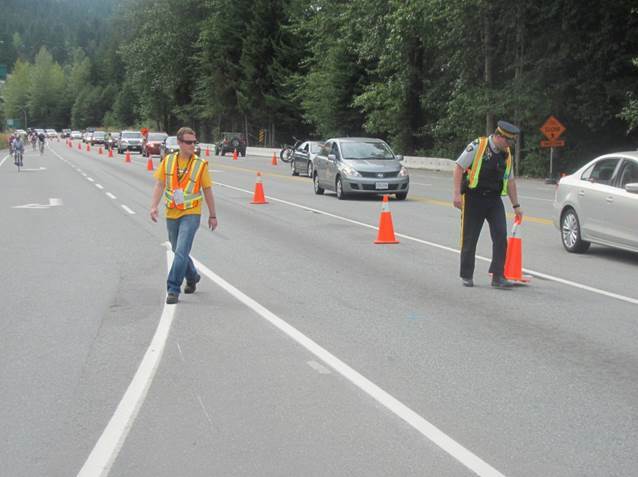 In the case of the Whistler’s 2013 Ironman, traffic planning started about eight months ahead of the Aug. 25 competition, to make sure everything went safely and smoothly. A complex traffic management plan was developed by the Ironman organizers working closely with the ministry staff. Part of the 180-km cycling route covered Highway 99, north from Whistler to Pemberton and back – a mostly two-lane stretch with narrow shoulders. To ensure the safety of athletes and motorists, this section was temporarily closed to traffic. The other part of the cycling route, southbound on Highway 99, between Whistler and Callaghan Valley Road, was closed on the morning of the race. (Northbound access to Whistler Village was maintained throughout the day.) Contingency plans were developed for urgent and emergency transport. Planning big events means massive coordination and consultation with many people. For the RBC Whistler GranFondo cycling event from Vancouver to Whistler, we meet monthly with representatives from five municipalities and the Ministry of Health (focussed on local hospitals and emergencies) to ensure maximum safety and minimal inconvenience. We coordinate plans with GranFondo Canada and everyone else that plays a key role including RCMP and police detachments, Miller Capilano Maintenance Corp., Mainroad Contracting, BC Ferries and engineering and electrical contractors. Phew! That’s a mountain of coordination. To ensure that motorists and truckers are not overly impacted by major happenings, we advise them of the upcoming event and how to avoid travel delays, through DriveBC travel advisory notices, newspaper and radio advertisements, overhead message signs and social media. Two weeks before the inaugural Subaru Ironman Whistler, information signs and portable changeable message signs were placed along municipal roads and provincial highways, from Greater Vancouver to Lillooet. On the big day, checkpoints at Alice Lake, and in Whistler, Pemberton and Lillooet, provided information about road closures and alternate routes. An event communication centre, operated by the Ironman organizers in Whistler (where we attended), monitored the event, managed incidents and distributed up-to-date information. Whistler’s first Ironman brought an estimated $15 million in economic benefits to local communities. Feedback from the participants, spectators and public about the event and traffic management was overwhelmingly positive. 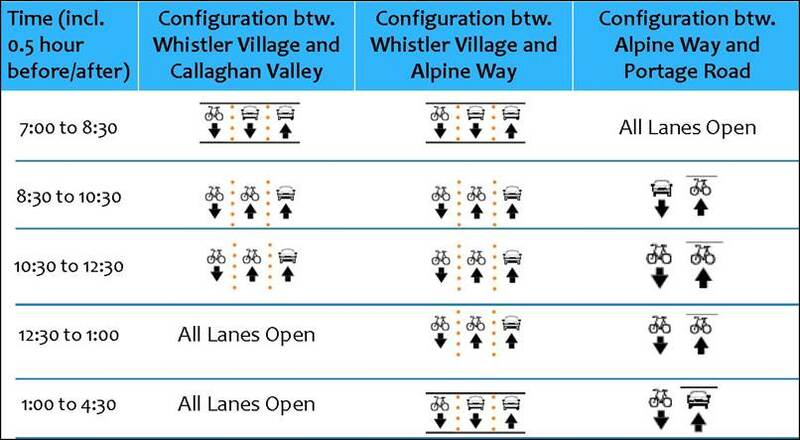 As a result, we are now planning traffic management for the 2014 Whistler Ironman, July 27. Likewise, we’re working behind the scenes to contribute to a safe, successful and enjoyable fifth Whistler GranFondo, on Sept. 6. When it comes to traffic planning for major athletic events that celebrate human-powered transportation, we’re stoked to be along for the ride. What special events have you seen happening on B.C. highways?